Global RUTF & RUSF market expected to reach approximately USD 809.43 million by 2024, growing at a CAGR of around 8.50% between 2018 and 2024. Ready-to-use therapeutic food is a term used to refer to the food which has special nutritional values. It is made up of powdered milk, vitamin, vegetable oil, peanuts, sugar, and minerals. The report covers a detailed analysis and forecast for the RUTF & RUSF market on a global and regional level. The study offers historical data for 2015-2017 along with a forecast from 2018 to 2024 based on revenue (USD Million). The study comprises a comprehensive view of the RUTF & RUSF market with the review of market drivers, restraints, and opportunities. It also provides the level of impact of drivers and restraints on the RUTF & RUSF market between 2015 and 2024. The study included a detailed competitive scenario and type portfolio of key vendors. The report evaluates Porter’s Five Forces model to analyze the different factors affecting the growth of the RUTF & RUSF market. Moreover, the study encompasses a market attractiveness analysis, which provides the most attractive and least attractive market segments information by product, raw material, Form, and region. The report includes detailed segmentation of RUTF & RUSF market based on product type, form, end-users, and region. 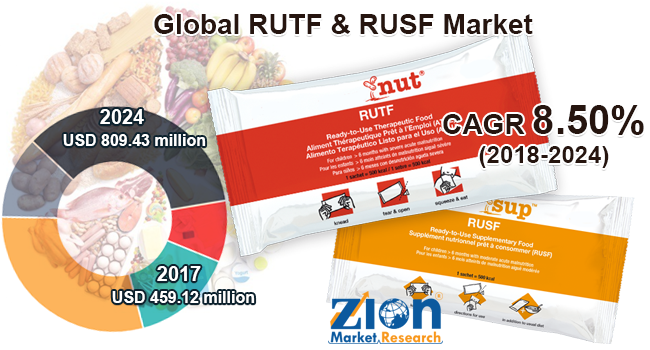 RUTF & RUSF are the key product type in the RUTF & RUSF market. On the basis of raw material, the market can be classified into the organization, retail, egg RUTF & RUSF, MPC RUTF & RUSF, and soy RUTF & RUSF. On the basis of form, the RUTF & RUSF market can be classified into solid and powder. Major regional segment analyzed in this report include North America, Europe, Asia Pacific, Latin America, and the Middle East & Africa with its further bifurcation into major countries including the U.S., Germany, France, UK, China, Japan, India, and Brazil. The report provides detailed competitive outlook including market share and company profiles of the key players operating in the global market. Some of the key participants in the report include Nutriset SAS, InnoFaso, Valid Nutrition, Meds & Food For Kids, Edesia USA, Diva Nutritional Products, Hilina, Mana Nutritive Aid Products, Insta Products, GC Rieber Compact AS, NutriVita Foods, Kaira District Cooperative, Nuflower Foods & Nutrition Pvt., Tabatchnik Fine Foods, Samil Industrial Co., and Power Foods Tanzania and others.